LODGING Dormitory, Student flat, Host family. 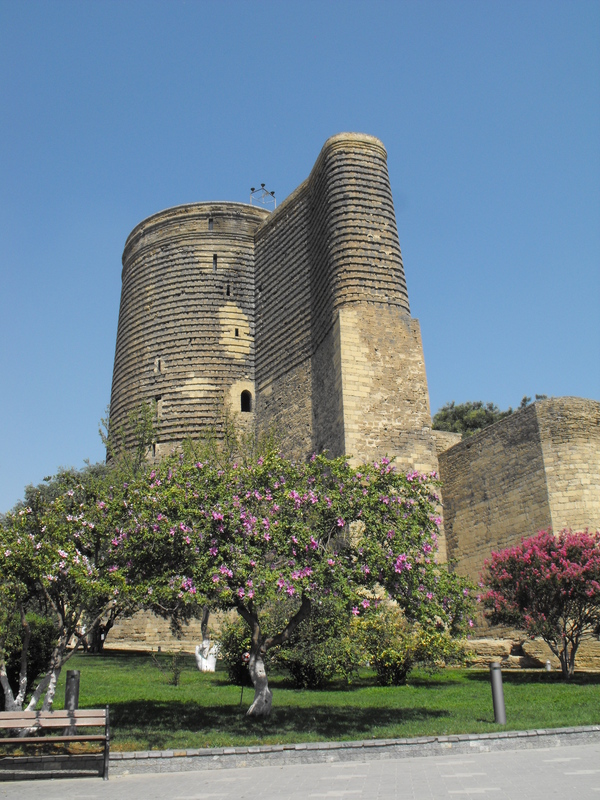 aku is a capital of the Republic of Azerbaijan. It is one of the largest industrial, scientific and cultural centres not only in the country but in the entire region. It is a major port on the west coast of the Caspian Sea, in the southern part of the Absheron Peninsula. The official language is Azerbaijani. Baku is divided into 11 administrative districts. The climate is temperate in Baku, with hot summer with low humidity and mild winter. The average annual temperature in January is 3.4 degree C, and in July - 25.8. Autumn is warm, much warmer than spring. Baku is the centre of cultural and scientific life of Azerbaijan. In 1873 there was established the first national Theatre, and in 1908 for the first time in the Muslim East was given the first opera “Leyli and Majnun”. The first Azerbaijani university and also the first library were opened just in Baku. More than 30 public and private higher educational establishments are concentrated in the capital of Azerbaijan, therefore Baku can be called the biggest university town. Not only Baku citizens, but also foreign students study in hundreds of different specialties at Baku State University, Azerbaijan State Oil Academy, Azerbaijan Medical University, Azerbaijan Technical University, Azerbaijan State Marine Academy, Azerbaijan Tourism Institute and other universities. There are many cultural facilities in Baku. Among these are theatres such as Azerbaijan Drama Theatre (www.azdrama.az), Opera and Ballet Theatre named after M.F. Akhundov (www.tob.az), Theatre for Young Audiences, Azerbaijan State Russian Drama Theatre named after S. Vurgun (www.rusdrama-az.com), Puppet Theatre named after A. Shaig (www.kuklateatri.az), Azerbaijan State Philharmonic named after M. Magomayev (www.filarmoniya.az); museums - State Museum of Musical Culture (www.musicmuseum.az), National Art Museum of Azerbaijan, History Museum of Azerbaijan (http://www.azhistorymuseum.az/), the world's first Museum of carpet (www.azcarpetmuseum.az), Museum of Modern Art (http://www.mim.az/), etc. Azerbaijan Medical University (named after Nariman Narimanov) provides the only institutional training of high quality physicians and pharmacists available in the Republic. Founded in 1930, it grew out of the Department of Medicine of Baku State University which was founded in 1919. We have six departments and more than 1,200 professors and lecturers. More than 400 foreign students which come from 20 countries. It confers both Candidate of Science (Ph.D.) and Doctor of Science (Postdoctorate-professorship) degrees. As mentioned above Azerbaijan Medical University has got an administrative building, 6 teaching buildings, 4 University Clinics (therapeutic clinic, Surgical Clinic, stomatological clinic and Clinic of Oncology), scientific-research centre, student canteen and buffets, health resort, a publishing house and newspaper, big sport complex with swimming pool, fundamental library and laboratories. More than 7 thousands students are studying at the 5 faculties, such as General Medicine 1 and 2, Medical prophylactics, Dentistry, Military Medicine and Pharmacy. Professional and research exchanges will be held in Therapeutic Clinic and Surgical Clinic of AMU, which are located close to the university. Surgical Clinic has 13 floors, Therapeutic Clinic has 14 floors, each floor is a special medical department. 1st floor of Surgical and 14th floor of Therapeutic Clinics are canteens. Azerbaijan Medical University (AMU) has a very good hostel system with fully furnished rooms, quite study environment and surrounded with recreation center. Azerbaijan Medical University (AMU) 9 hostels with the total area of 44512 sq.m for accommodation of 4356 students. Our social program is designed to fit interests of everyone who is interested in exploring the ancient culture and history of Azerbaijan, as well as witnessing modern developments and urban life. We organize also trips to different regions of Azerbaijan on weekends. Our Social Program includes tours not only in Baku but also in other regions such as Shaki, Shamakhi, Qabala etc. Students can enjoy the hot summer on the shore of Caspian Sea with its fascinating beaches and the picturesque mountain views in the regions of Azerbaijan. Feel the spirit of fire and learn the secrets of the Land of Fire! We would be very happy to meet every incoming in Azerbaijan- the place where the East meets West! Icheri Sheher or the Old Inner City is the oldest part of Baku and is surrounded by fortification walls dating back to the 9th century. The streets inside the historical core of the city have been designed to block the strong winds coming from the Caspian Sea. In a country where flames burst forth naturally from the ground, it should come as no surprise that fire has been worshipped since ancient times. This ancient Hindu temple in a Baku suburb was abandoned in 1883 after new oil and gas plants built nearby tapped into the same underground reserves and in doing so inadvertently extinguished the temple’s holy eternal flame. The Palace of the Shirvanshahs, located in Baku, is a UNESCO World Heritage Site built in the 15th century by the Shirvanshah dynasty. This monument is the biggest piece of architecture under the Shirvan-Absheron branch and includes the main building, Diwan Khana, The Mausoleum, The Palace Mosque and The Palace Bath-house. The construction of the palace was initiated under the rule of Ibrahim I of Shirvan dynasty. The Palace is open to visitors from 10:00 am to 5:00 pm. 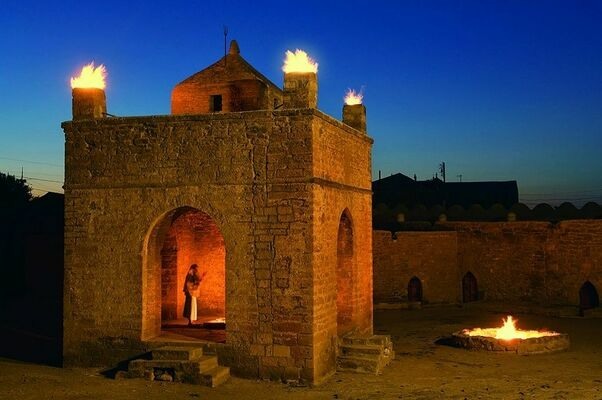 Yanar Dag, translated as the "burning mountain" is a hillside near Baku that continuously vents flames of fire all year round, a process that has been going around for 1000 years. Natural gas vents on the sides of the mountain make sure that the flames don't subdue despite of rain. Superbly kitsch and famous after their appearance in the 2012 Eurovision Song Contest, Baku’s Flame Towers are a trio of skyscrapers entirely covered with LEDs. The lighting pattern shifts from flickering flames to the Azeri flag and back, lighting up Baku’s night sky. Baku is located on the Absheron Peninsula in Azerbaijan, and is the largest city on the Caspian Sea. This huge body of water is the world’s largest lake but its expansiveness means that it truly resembles an ocean from the shores of Baku. Baku’s city-centre beaches offer an excellent vantage point for travellers hoping to gaze at the Caspian. However, for people planning beach holidays in Baku, out-of-town beaches offer more scenic destinations. Bilgah, Mardakan, Nardaran beaches boast clean sands and wonderful Caspian views.